Born in Istanbul. Hakan Şensoy started his violin training under the supervision of Prof. Ayhan Turan, in “Fast Training Special Violin Unit”. Since the first recital he gave in 1984, he has participated in many orchestra concerts as soloist and conductor at the prestigious concert halls (New York Carnegie Hall, Lincoln Center – Paris Louvre Auditorium, Milan Sala Verdi) in Italy, Albania, Switzerland, United Kingdom, France, Bulgaria, the United States, Australia, Romania, China, Japan, Finland, Greece, Latvia, Azerbaijan, Estonia, Netherlands, Singapore, Sweden, England, Croatia, Macedonia, Kosovo, Bosnia-Herzegovina, Germany, Russia, Venezuela, Mexico, Czech Republic, Northern Cyprus and Turkey, and has given recitals. In 1985, he was awarded the “Most Successful Young Artist of the Year” by the Istanbul Philharmonic Society and received the “Outstanding Achievement in Art” award from the hands of ITU Rector in the same year. In September 1988, the recital gave in Istanbul AKM was taken by UNESCO to the scope of Global Education campaign, and in this concert, UNESCO from many countries were present. In the same year, he began his education at the Royal College of Music in London to pursue his post graduate studies. He graduated from Trevor Williams’ class here. In 1992, he won fourth place in the International Rovere D’Oro Chamber Music Competition held in San Bartolomeo, Italy. Since the same year, he has been invited to Bari International Christopher Columbus Festival, International Istanbul, Izmir and Ankara Bodrum D-Marin Turgut Reis and Gümüşlük Music Festivals, CRR Concert Hall Young Soloist Festival, Brasov International Chamber Music Festival and Malmö “Falsterbonasets” International Summer Festival, Sweden Karlskrona International Music Festivals many times as a soloist and conductor. At the 34th International Istanbul Music Festival, he took part in three different concerts as a soloist, concertmaster and conductor and took his place among the rare artists who took part in such an event with three separate disciplines on stage. He completed his master studies at ITU Institute of Social Sciences in 1990-92. During the 1992-93 season, he was the guest concertmaster of the Çukurova State Symphony Orchestra, and he was also the concertmaster of the Cemal Reşit Rey Symphony Orchestra between 2000 – 2003, Akbank Chamber Orchestra between 1996 – 2011. He is also the founder of the Milli Reasürans Chamber Orchestra, the founder and the General Music Director of Istanbul Chamber Orchestra and the Philharmonia Istanbul. Hakan Şensoy, who participated in many radio and TV programs as producer and commentator, also pays attention to interpreting the works of our national composers. CD recordings of the artist performing the first vocalization of dozens of works, most of which are attributed to himself as a violinist and conductor, are presented with KALAN Music and AFM Records label. Şensoy, who completed his doctoral studies in 2002 at ITU Institute of Social Sciences, continued his performances for a while with State Artist Ayla Erduran, and famous Russian Violinist and Pedagog Victor Pikaisen. The artist, who received his first conducting lessons from Demirhan Altuğ between 1981 and 1987, later worked with Emin Güven Yaşlıçam and attended Gianluigi Gelmetti’s conducting course in Accademia Cicciana di Sienna in the summer of 2003. The artist, who accompanied world-renowned soloists such as Sholomo Mintz, Raphael Walfisch, Fazıl Say, Cihat Aşkın, Ryu Goto, Tedi Papavrami, Peter Jablonsky, Bruno Schneider, Gülsin Onay, Emre Elivar, Keneth Hamilton, Steven Isserlis, Adrian Brendel, Peter Jablonsky and extraordinary soloists and bands such as Terence Blanched Band, Bee Gees Band, Dreamtone & Iris Mavraki’s NEVERLAND, George Benson, George Dalaras, Alim Qasimov, Fergana Qasimova as a conductor, performed as a soloist in recitals and took part in orchestra concerts in many countries in a wide range of continents from Australian Continent to Americas. Şensoy, who was elected as the Music Director of the Chamber Orchestra of Karşıyaka Municipality as of 2015, was invited to conduct . 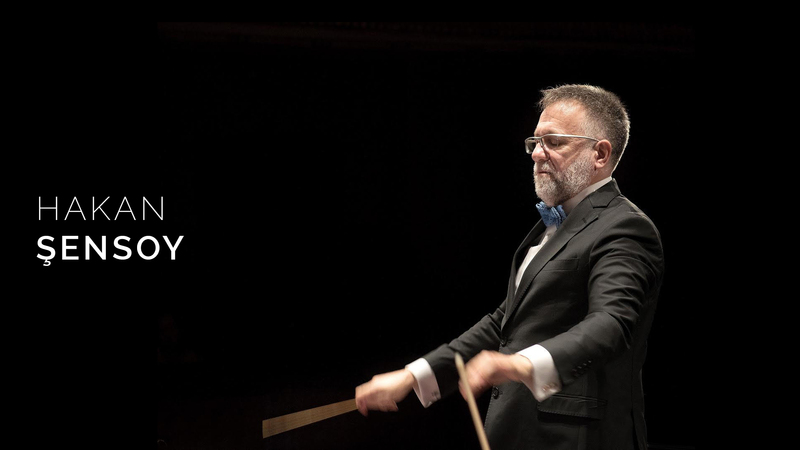 As the first and only Turkish conductor on the stage at Milan Teatro alla Scala in 237 years, the artist is pointed the General Director of Izmir State Symphony Orchestra since 2018-2019 season. Hakan Şensoy is currently a Asst.Prof. at ITU Turkish Traditonal Music State Conservatory. © 2018 İzmir State Symphony Orchestra.